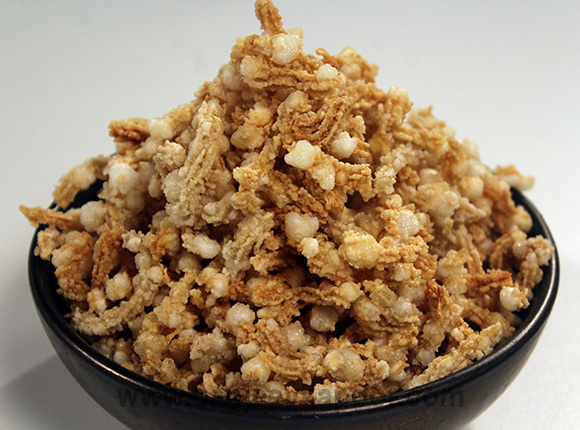 Chakli the popular snack made with sabudana, samo and potatoes instead of flour. Heat two cups water in a non-stick pan. Add samo and cook till it turns soft. Cool and sago, potatoes, ginger-green chili paste, baking soda and salt and mix well. Fill the mixture in a chakli press fitted with chakli stencil and press out small roundels on a plastic sheet. Sun dry for two days. Heat sufficient oil in a kadai. Deep-fry the sun dried chaklis till light golden and crisp. Drain on absorbent paper. Use hand gloves to mix the mixture to avoid burning of hands.